DJ Python - Dulce Compañia. Vinyl LP. Bleep. 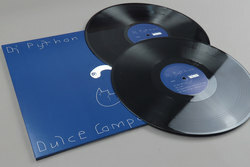 DJ Python drops what is sure to be one of the years most cherished with Dulce Compañia, a heady mix of deep Reggaeton soundboy stylings that takes pride of place as the opening gambit on Incienso, a new label run by Anthony Naples and Jenny Slattery. 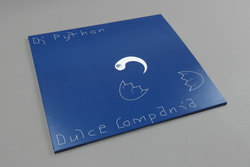 Throughout Dulce Compañia, DJ Python effortlessly glides between styles that land within the central point of a triangle built from dub, house and of course Reggaeton. All executed with an edge so deep, it will take more than a few listens before you can come back up for air. Sitting nicely between recent years future-classics that have emerged out of NYC's downtempo dazzling scene, DJ Python's debut is sure to gain much love from all that are still burried deep within the foggy haze of For Those Of You Who Have Never (And Also Those Who Have) by Huerco S. and Madteo's Sahko sub-a-dub Noi No. 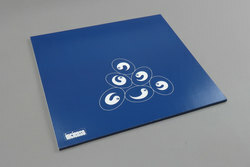 Brilliantly melting minds, everything from Main Street style reductions through to cut 'n' paste breakbeat trips ala Sofofett in Wania mode are dissolved into a style that while it borrows from many different avenues, is made entirely Python's own. Massive hype on this one, and justifiably deserved in every respect.